As you all know, this past weekend I spent 5 days visiting some of Neil’s family in North Carolina. As evidenced from the onslaught of food pictures, you also know that it wasn’t the healthiest of weekends. There were entire meals that went undocumented and some that I am saving for Friday’s post. All of it was delicious and I seem to have forgotten the definition of moderation while I was outside of my cozy Chicago cocoon. Most fitness articles talk about tips to stay on track during vacations and how to hop back on if you fall off, but I wanted to take a slightly different approach and discuss why it is important for me to sometimes take a break when I decide to go on a vacation. Note: These are my experiences and everyone may not have the same results. If you are in the beginning phases of an exercise or nutrition plan, tips to help you make those changes habitual and part of your lifestyle are extremely helpful. The biggest takeaway is to learn to listen to your body through the journey and find what works for you. Most of my days and weeks tend to fall into a pattern and I try and work out between 4 and 5 of those days. I have “rest days” built in since I am not exercising 7 days a week, but it is rare that I actually take an extended period of time to rest and let my body recalibrate. Taking a break allows me to sleep more and lets my muscles relax so that I am ready to go when it’s time to come home. Your body needs constant variables in order to change and adapt. That’s why doing the same workout for an extended period of time is going to cause you to plateau at some point. Changing workout structure, weights, reps, etc. is what helps you achieve your fitness goals. Part of keeping your body guessing is to also allow it sufficient time to rest. Taking a few days or a week off of exercise is not going to set you back to square one. I had originally planned to lead a bootcamp workout Sunday morning, but when the time came there was an injured back and a lot of oversleeping involved, so we called for a rain check. I had also planned on going for a run on the trails, but since it rained the entire time, there was also a rain check on that one (pun intended). Rather than freak out that I wasn’t able to exercise, I learned to go with the flow. The plans didn’t work out, but I was able to spend more time with family which is also a great plan. In the past, every time I’ve had to take a break from exercise, be it from injury or just inconvenience while out of town, I’ve worried and obsessed about what I’m eating, how much weight I will gain, and how quickly I’m losing muscle and endurance. What I learned after every one of those times was that none of that was necessary. I have always been surprised at how my body responds to taking an exercise break. Sometimes after not exercising and eating way more food than normal, my body actually looks better than when I was so rigid with my own personal boundaries. This is one of the biggest reasons that I cut myself some slack while on vacation. I have learned through experience that whatever fears and projections I make never come true and in some cases I look and feel better than I did before. I enjoy taking the periodic break, but when it’s time to come home and return to the real world, I realize how much I actually enjoy exercise as part of my routine. The more I force myself to do it when I don’t want to, the less I will get excited about it. Even if I am having an off day during the week, I will listen to what my body is telling me. It may result in me skipping that workout or scheduling it at another time, but I always feel better and more invigorated when it comes time to work out again. How taking a break from exercise during vacation can actually benefit you! How do you approach exercise and vacation? Do you prefer to maintain the same routine as home or do you vacation differently? #4 is key for me! I have to get to that place where my body aches to move and sweat. Sometimes that means giving myself space so I can return to my workout with a sense excitement and engagement. Thanks for sharing your great post! yes! I always take a break during vacation. It’s good to give your body at least a week of rest every training cycle (usually every 3-4 months), and vacation time is the best time to do it! I definitely take a bit of a step back during vacation, but I also do love working out on vacation because it helps keep me um… regular WINK WINK. And make more room for foods. But I am more likely to just walk in lieu of a “proper” workout on vacation. And I love to run in new places! I think back to when I used to freak out if I was on vacation or my schedule wouldn’t allow me to workout. It took a long time to realize that is just not true. Our bodies need that time to restore and grow stronger. Great post lady! Exactly! Take me on vacation w you. I just got back and I’m ready for more! 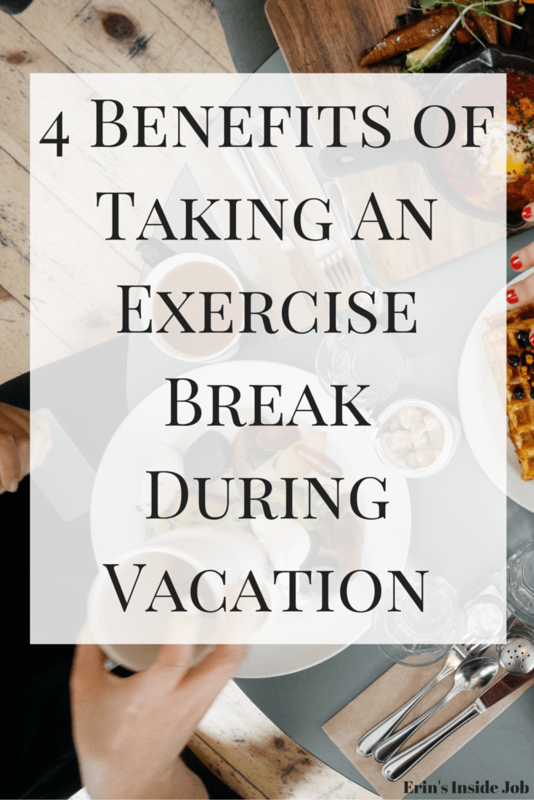 Loved these reasons for benefits of taking a break during a vacay 🙂 I don’t do the same workouts on vacation, but I try and move a little more than I normally would – short jogs outside, little Nike Training Club workouts on the iphone, etc. If I do work out on vacation it’s always much less intense than whatever I normally do to work out. I think the biggest thing for me is being ok if I don’t at all!